As St. Benedict’s Dispensary increases its years of service so does it increase the number of service units. In 2013, another service unit, the Dental Clinic was blessed during the feast of St. Benedict. The dispensary began it's operation on the feast of our Lady's Assumption with several sisters being the first patients to receive care. We are fortunate to have a visiting dentist that comes twice a week to attend to patients who are in need of care and basic check-ups. The dental equipment are gifts from Mr. Josef Wiederkehr and his family from Peramiho. The equipment was sent a long time ago and came as a gift, through the kindness of Sr. Ma Goretti who was assigned in Jinja for a short time. 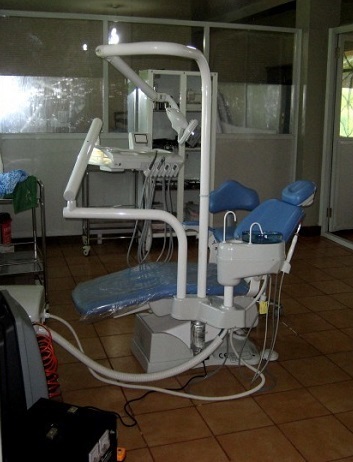 In the next year, additional equipment such as dental x-ray unit will be added to the clinic. The clinic has prepared for the arrival of new equipment by procuring their own power supply in anticipation of additional consumption of electricity. The cost is worth it when providing care to others in need.